As I am in Norwich, I thought to share with you one more tourist attraction here, The Norwich Castle. Norwich Castle is a medieval royal fortification in the city. It was founded in the aftermath of the Norman conquest of England when William the Conqueror ordered its construction because he wished to have a fortified place in the important city of Norwich. It proved to be his only castle in East Anglia. 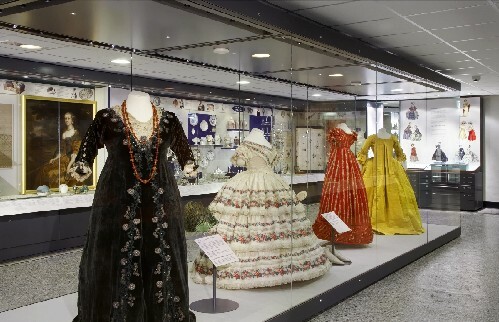 In 1894 the 'Norwich Museum' moved to Norwich Castle and it has been a museum ever since that holds significant objects from the region, especially archaeological finds and natural history specimens. El castillo de Norwich es una fortificación real medieval en la ciudad. Fue fundada a raíz de la conquista normanda de Inglaterra cuando Guillermo el Conquistador ordenó su construcción porque deseaba tener un lugar fortificado en la importante ciudad de Norwich. Resultó ser su único castillo en East Anglia. 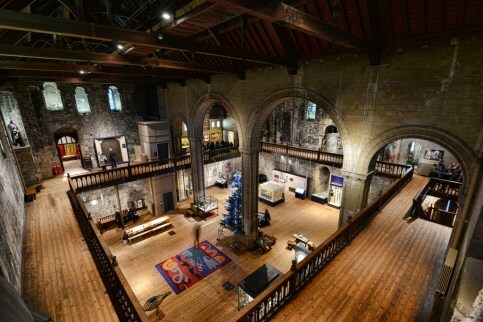 En 1894 el 'Museo de Norwich' se trasladó al castillo de Norwich y ha sido un museo desde que contiene objetos significativos de la región, especialmente hallazgos arqueológicos y especímenes de historia natural. There is a big area of gardens to walk around the Castle as well as great views of the city. Alrededor del Castillo hay muchos jardines y paseos para andar así como muy buenas vistas. This post is also a collaboration with SAMMYDRESS , an online store that I have already collaborated with, I am once again very pleased with their clothes, especially the boots, that I really wanted to have but every time I was trying them in different shops, they were to wide, too high or too flat heel, I just wanted a medium heel and these are perfect! They are faux suede but a really nice quality. The lace up sweater is something I was really looking forward having it as it has been one of the trends this winter. Este post es además una colaboración con SAMMYDRESS, una tienda online con la que ya he colaborado anteriormente, estoy de nuevo muy satisfecha con su ropa, especialmente estas botas altas, que me apetecía mucho tener pero que cada vez que me había probado otras en diferentes tiendas eran muy anchas y me quedaban muchas arrugas en la pierna o el tacón era muy alto o eran totalmente planas y éstas han resultado ser perfectas! Son faux suede pero de muy buena calidad. El jersey de cordón es algo que estaba deseando tener porque ha sido una de las tendencias de este invierno. Have a fabulous week everyone!!! Wow,what a beautiful place..and photos 💘 I love it ! Me alegro de que ya estés recuperada! Las fotos geniales y el lugar parece de lo más tranquilo... dan ganas de visitarlo! I'm glad to hear that you're feeling better. Recovering can be tough but at least it happened during Winter, and now you can make use of Spring and sunny weather. Norwich castle seems like a lovely place to visit. The photos you took are fabulous. I also really like your outfit. Very girly and pretty...and trendy! These OTK boots are gorgeous and they're quite affordable too. I just checked the site and I they are something like 30 dollars, that's a good price, now I tempted to order them. Geniales las fotos y me encantan las botas y el jersey! Un beso guapa. You always visi interesting places! Unas fotos muy chulas. El jersey lo tengo y es muy mono. Vaya me alegra de que ya este bien y con ganas de volver a la carga!! El lugar es increíble! Y me encanta tu look y tu jersey de cordones! UN beso guapa! I'm not much on history but I think I remember that the Battle of Hastings was in 1066. I assume this castle wasn't built too long afterward. The castle looks to be in excellent condition. Que hermoso lugar, mucha historia. Such paculiar and beautiful castle! Seems very interesting to visit, inside and out! Que bonito es este castillo. Tu outfit te sienta divino. por cierto espero que pronto estés al 100% ya, aunque de vez en cuando viene bien un descanso para volver con más energía! Me haencantado el paseo, qué bonito, tiene que ser impresionante verlo en vivo. Maravillosas las fotografías como siempre, es un remanso de paz y tranquilidad que ganas de ir allí. Espero que lo de la operación no haya sido nada importante y estes recuperada a mi también me operaron en octubre por primera vez y fue bastante duro ;-S. Muchas gracias por seguirme desde Instagram yo también te sigo. Por cierto hoy tengo un post de viajecito a ver si te pasas y me aconsejas. Besitos y buen finde. Have a wonderful weekend, dear Nuria! Un post muy informativo, gracias por contárnoslo ;) En cuanto al look, me encanta... tengo el jersey y no paro de usarlo ... y las botas son preciosas! Me ha encantado! Un besiiiin! Que post más bonito. Son fan de los castillos, de La épocas antigua y me ha recordad mucho a la serie de Outlander tu post. Que envidia me has dado.